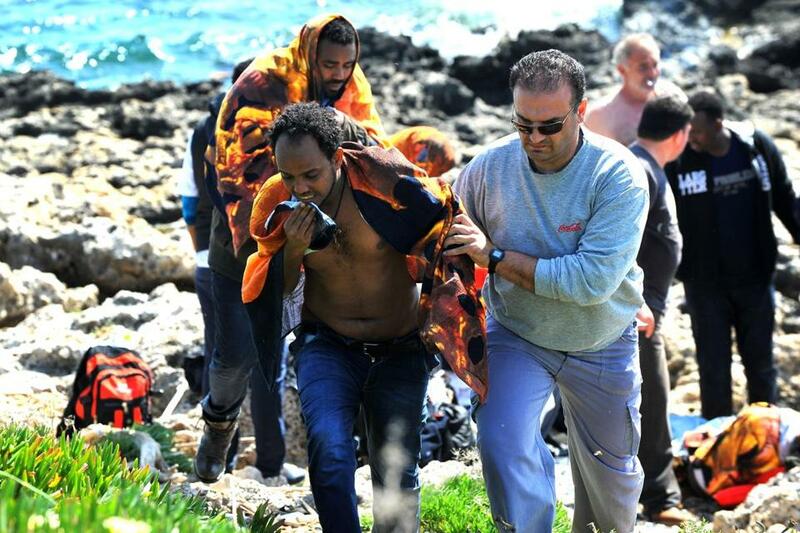 A Greek man assisted a migrant on the Greek island of Rhodes Monday. FOR TOO long, the world has been watching in horror as African and Middle Eastern migrants drown while trying to make a dangerous voyage across the Mediterranean Sea to Europe. In the latest — and worst — tragedy to date, an estimated 700 people are feared dead after an overcrowded ship sank 70 miles off the coast of Libya Saturday evening. Even as Italian and Maltese boats plucked bodies from the water and the prospect of finding any more survivors dwindled, there were reports Monday of other ships in distress. Already this year, more than 900 migrants have perished in the Mediterranean — a tenfold increase compared with the first four months of 2014 (which ended with a record toll that topped 3,000). Some groups, including Human Rights Watch, have accused European leaders of reacting slowly and inadequately to these at-sea disasters. Indeed, there is no doubt that the European Union can do better. It must act more quickly to rescue those in immediate peril, but it also needs to take actions to prevent such large-scale disasters from happening in the first place. Saving lives should come before protecting European borders from people so desperate to find a better way of life that they are willing to risk death. European officials met Monday in Luxembourg to discuss the shipwreck disaster still unfolding in the Mediterranean, and to review a plan that includes doubling the size of Triton, the EU-funded naval operation launched in November primarily to patrol waters off the coast of Europe. It may seem like a logical response, but expect criticism from some quarters. In 2013, Italy launched Mare Nostrum, a massive emergency response operation credited with saving more than 100,000 lives. Focusing on sea rescues, the operation drew political opposition in Italy and throughout Europe because of fears it would encourage more migration. With criticism mounting and resources — including backing from the EU — shrinking, the program was ended about a year later. Triton was intended to replace Mare Nostrum, but the EU committed only about 3 million euros a month for its funding, compared with the 9 million euros that were being spent monthly by Italy on Mare Nostrum. Given the events of the last few days, the plan to double Triton’s funding may prove inadequate before it’s even put in place. Perhaps the EU could learn from Italy — even without Mare Nostrum, that country’s response to the latest Mediterranean shipwrecks has been efficient and impressive. According to the International Organization for Migration, Italian authorities reported rescuing 10,000 migrants during a six-day period that began April 10. The breakdown of the social order in Africa creates complex challenges for any type of response to what has become an intercontinental migrant crisis. A long-term, comprehensive, and multi-faceted strategy is needed. It should include the creation of a processing center in North Africa, a plan to stop smugglers who move people under life-threatening conditions, and the institution of cohesive European immigration and refugee policies. The European Union has a moral duty to provide the financial resources and manpower to stem this escalating humanitarian crisis. Correction: An earlier version of this editorial misspelled Luxembourg.